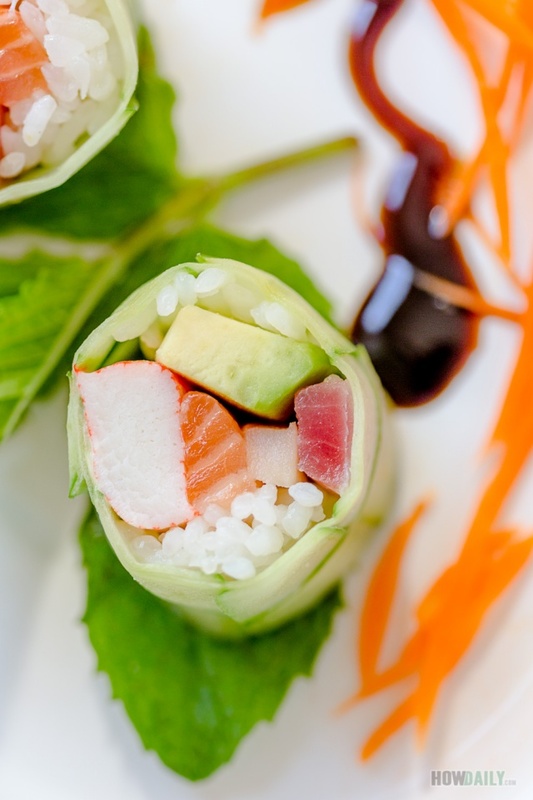 New York sushi roll is one of the many popular American sushi rolls that served widely in the States. 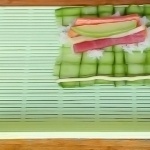 With this roll, the most standout point is to use thin cucumber strips to replace traditional nori wrapper. 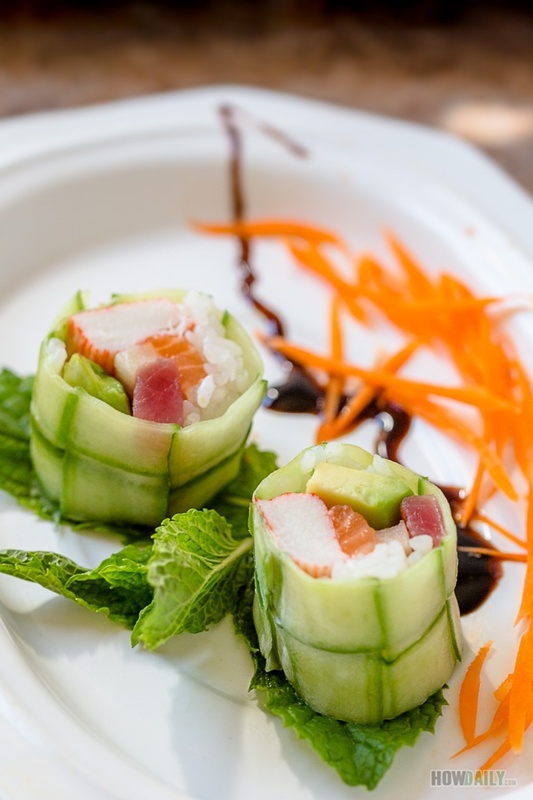 Most New York sushi rolls don’t include sushi rice due to the moisture in cucumber with prevent the rice being adhered to it. 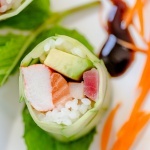 This recipe, however, inspire and adapt from this roll, while also adding a little sushi rice in for the starch craving eater and balance well with all the fish used. I used 3 types of common sushi grade fish in the States: salmon, red tuna, and hamachi. But you can replace them with any types of fishes you want or just use one of them for a more concentrating taste. The cucumber wrapper, even though still being delicate, is easier to wrap after basket weave in to rectangular wrapper. I just happen to like this style more than the traditional spiral thin slice all around, cause this made it more like roll & wrap compare to filling. For the kids, I would add some Kewpie mayo since they like theirs more cheesy. I like mine more oriented with some dabs of wasabi on the fish sticks while hubby like his spicy with Sriracha. See the pattern here, just add any sauce you want since not only they add to the taste but also help binding the ingredients a little bit. Customized and change them to your liking. 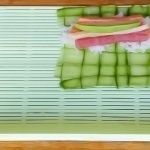 New York sushi roll in basket-weaved cucumber wrapper with three types of fishes, kani and avocado. 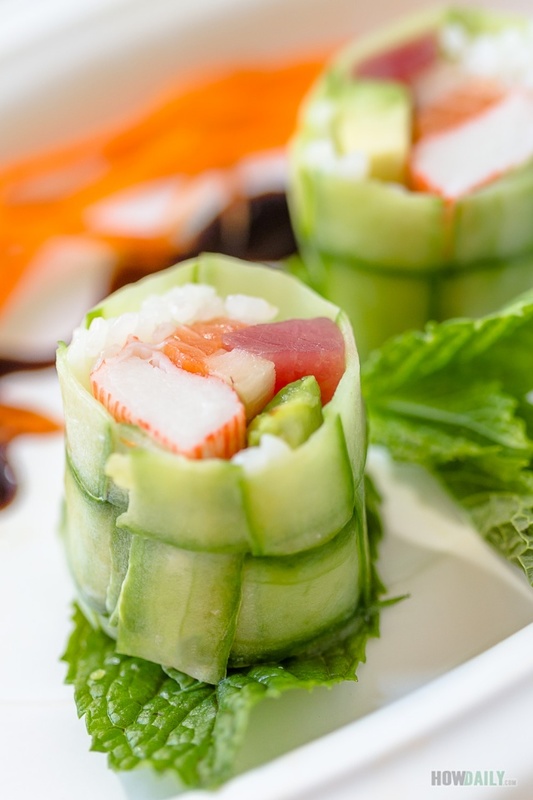 This roll tastes so fresh and yum yum that any sushi fan would love. Cut all the fishes into long strips. Wash the cucumber, then rub it with some Kosher salt. Let sit for a couple minute before lightly rinse. 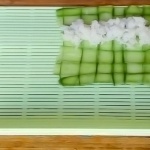 Use a peeler to slice cucumber into thin lengthwise strip. 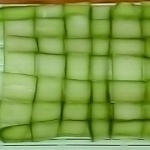 Divide the usable of similar width cucumber slices into two, and basket weave into rectangular shape wrapper. 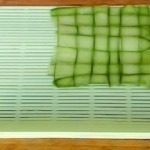 Have a plastic wrap on a flat surface then place this weaved cucumber wrapper on top. Spread 2 nigiri size rice ball along one side. Now arrange all the fish, avocado and crab sticks. Drizzle some sriracha and Kewpie mayo if you like the taste and a little extra spice, otherwise just keep. The sauce do give better binding for ingredients. Carefully wrap and roll the wrapper into roll, as the weaved wrapper quite delicate, make sure the plastic is wrapped around the whole roll. 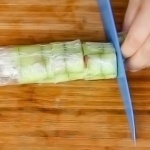 Wrap a saran wrap around the roll for easier cutting. Use a sharp knife to cut into piece while plastic wrap still on. Serve with some wasabi and garnishment.